The thing about going to bars in Paris is that you don’t just want them to provide you with fussy (overpriced) drinks. You want a real experience, a few kooky encounters, a bit of drama—something memorable to chew on, dammit! 6, rue de la Main d’Or, in the 11th Arrondissement. 01 49 23 41 14. When I first moved to Paris, I went on a date with a guy whom I pretty much had nothing in common with. Like really, nothing. But to his credit, he had the whole Jim Morrison thing going on, and so off on a date we went (you’ll take anything when you’re new to a city). Sitting directly opposite him over a carafe of vin rouge, I quickly realized that he was more grunge (as in lack of shampoo) than rock god. I had just started to calculate an elaborate early-escape plan when he began telling me about the most rock ’n’ roll bar in Paris I would apparently ever come across: Le Fanfaron. He spoke of an authentic ’60s vibe, the fiery co-owning Parisian couple that played out their lovers’ tiffs at the bar, knocked back tequila shots with the customers and played Jimmy Hendrix vinyls all night if they wanted to. Needless to say, I took a mental note of the venue’s name, ended the date by informing him of my upcoming move to Yemen and headed sans Jim “Greasy Hair” Morrison to Le Fanfaron the following weekend (note: not really moving to Yemen). 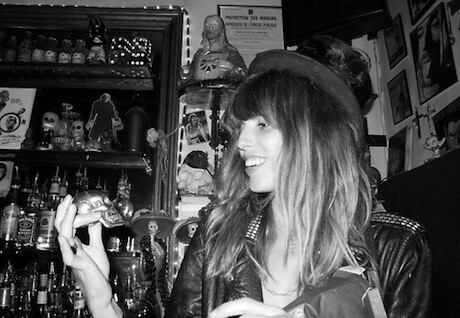 I had done my Googling and found that Le Fanfaron was in fact one of the favorite Parisian bars of none other than my girl crush du jour, Lou Doillon (a.k.a. daughter of Jane Birkin). In a very caché backstreet off Ledru Rollin (near Bastille), my girlfriend and I found what seemed to be a bit of a local secret. Situated on a narrow residential street, Le Fanfaron is a place that could only be found by word of mouth. The clientele is a fascinating mix of artists, musicians, writers, travelers young and old, using this intimate but psychedelic setting as if it was their own communal living room. It’s highly unusual to go to Le Fanfaron without meeting someone new, without witnessing one of the bartenders’ sensational alcohol-infused tantrums and certainly without having something pretty rock ’n’ roll to tell your friends about. 8, rue Laplace, in the 5th. 01 46 33 75 03. I’m not one to beat around the bush, so let me just throw it straight out there—Johnny Depp occasionally drinks beer here. Do I need to continue? Behind the stunning setting of the Panthéon—great for that memorable, slightly tipsy, scenic route home—students of the Sorbonne mingle alongside laid-back thirtysomethings in a decor reminiscent of a rock star’s underground lair. Oh, and Johnny Depp, Johnny Depp, Johnny Depp. 52, rue Galande, in the 5th. 01 46 34 23 09. I love blues rock ’n’ roll—you know, the kind that consists of a soulful harmonica player, a dirty electric guitar solo and lyrics like “woman you ain’t no good for me.” On Sunday nights Le Caveau des Oubliettes is exactly where you need to go to be seduced by the best live blues in Paris. 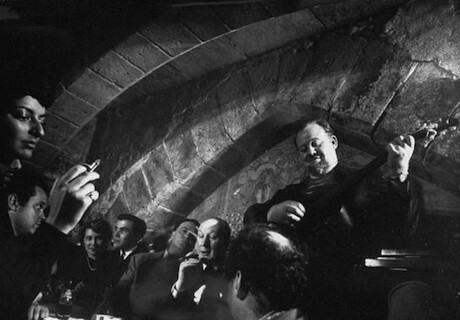 It’s the oldest jazz bar in Paris, frequented by the likes of Orson Welles and Jean-Paul Sartre, and there’s nothing much to the bar upstairs, but it’s the 12th-century underground wine cellar that draws in the music-savvy crowd. It’s cozy to say the least, so be sure to arrive before 9 p.m. to get a seat. 19–21, rue Boyer, in the 20th. 01 46 36 07 07. When I fear that I’m getting a little too comfortable in my bubble of the 5th and 6th Arrondissements, I haul myself up to the 20th, one of the most eclectic areas of Paris, which has the diversity of Belleville and of course the resting place of Jim Morrison, at Père Lachaise. 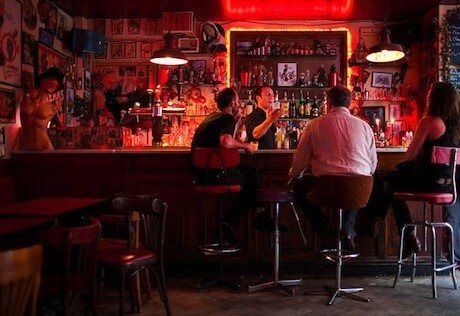 La Bellevilloise strikes you as more of a social club than just another bar. There’s constantly something going on here, live bands, small festivals of art and music, mini fashion markets, screenings or exhibitions. This indie hot spot’s summertime clientele comes from all over Paris to have drinks on the rooftop terrace that boasts eye-popping views over Belleville. 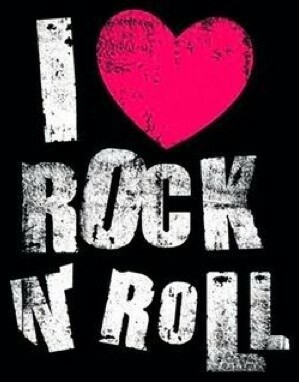 So there we have it, not for the weakhearted, something a little grittier than your average cocktail bar and all about embracing your inner rock star. Editor’s note: A few rock ‘n’ roll hotels to check out are Mama Shelter, with decor by Philippe Starck (and it’s affordable! ), and the Five Hotel in the 5th Arrondissement.